Filling for 4 pepper; 4-5 eggplants (and a medium size dish of grape leave dolmeh, which I will post separately).This could be served as appetizer, side dish or main dish. Ground beef or veal, 500 grams. Herbs: parsley, chives, dill 1/2 bunch each, chopped. Basil and tarragon, 2 tbsp. chopped (you can always use a combination of fresh and dried herbs depending on the availability). 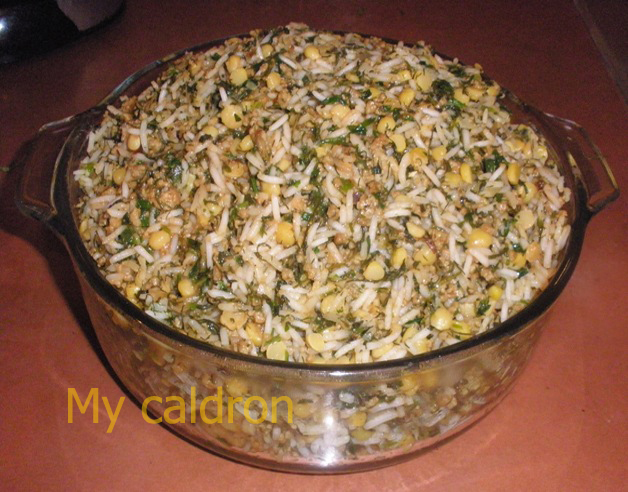 Variation: skip the meat and you will have a perfectly wholesome vegetarian dish. 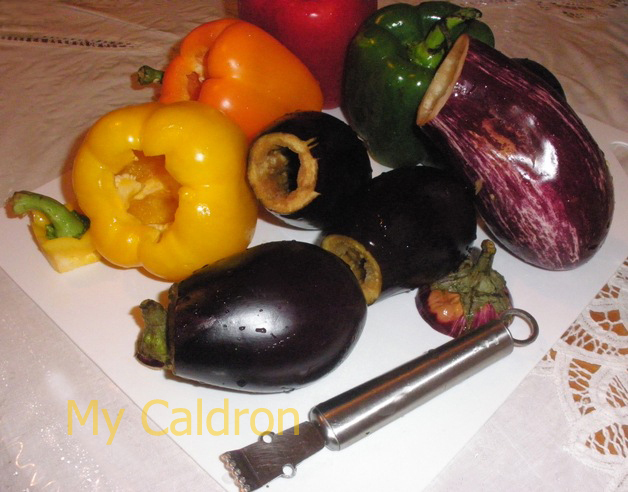 Method: Cut the top parts of peppers and eggplants in circles. Cut off seeds from the top of peppers’ heads and thoroughly wash inside of them and salt. Scoop out most of the fleshy pulp of eggplants. Salt inside briefly and bake them in pre heated oven at 300 F. for 30-45 minutes, turning them at least twice. In a frying pan stir fry sliced onions in hot oil until slightly golden. Add ground meat and fry for ten minutes until brownish; stir constantly to separate the meat in small bits. Add turmeric, salt, pepper, and mix well. Put aside. Rinse rice and split peas. Place them in two medium pots and add one cup of water in each pot, in addition to a pinch of salt and cook on medium heat until water is absorbed. Cooking them separately ensures they are both cooked at core without either of them becoming mushy; they might have different cooking times. Spoon the filling into the eggplants and peppers shells till they are full, but do not press down the stuffing. Put the tops back on each vegetable and gently press them down. Place the stuffed eggplants and peppers shells in two separate pots large enough for one row of them standing next to each other. Place over medium heat and pour the rest of the sauce over the filled shells in the two pots and cover the lids. Once enough steam is built up inside the pots, cover the pots’ lids in kitchen paper towels, and steam cook for one hour on minimum heat for 45-60 minutes or until done. Do not overcook. You should be able to gently transfer them into a serving dish without breaking them. If you decide to cook stuffed tomatoes and onion, pick hard almost unripe tomatoes and red onion. Cut the top part, scoop out the pulp; spoon the filling and cover, just the way you did for pepper and eggplants. 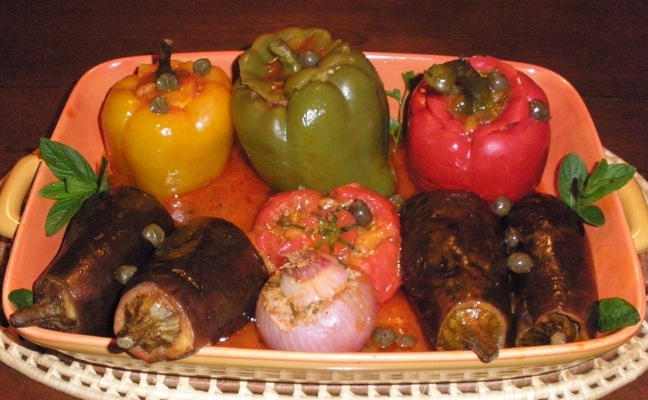 Stuffed tomato is cooked in 5 minutes and stuffed onion is done in 10-15 minutes. They are very gorgeous and inviting when placed next to eggplants and pepper dolmeh. And of course, each have their own distinct fantastic taste.